Ischemic preconditioning confers organ-wide protection against subsequent ischemic stress. A substantial body of evidence underscores the importance of mitochondria adaptation as a critical component of cell protection from ischemia. To identify changes in mitochondria protein expression in response to ischemic preconditioning, we isolated mitochondria from ischemic preconditioned kidneys and sham-treated kidneys as a basis for comparison. The proteomic screen identified highly upregulated proteins, including NADP+-dependent isocitrate dehydrogenase 2 (IDH2), and we confirmed the ability of this protein to confer cellular protection from injury in murine S3 proximal tubule cells subjected to hypoxia. To further evaluate the role of IDH2 in cell protection, we performed detailed analysis of the effects of Idh2 gene delivery on kidney susceptibility to ischemia-reperfusion injury. Gene delivery of IDH2 before injury attenuated the injury-induced rise in serum creatinine (P<0.05) observed in controls and increased the mitochondria membrane potential (P<0.05), maximal respiratory capacity (P<0.05), and intracellular ATP levels (P<0.05) above those in controls. 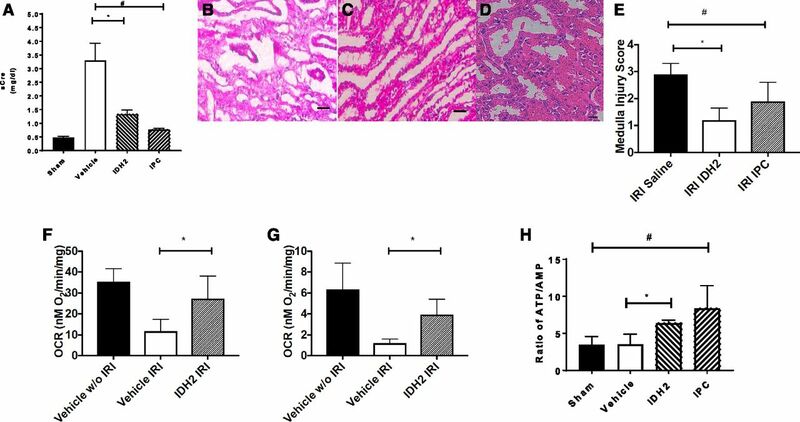 This communication shows that gene delivery of Idh2 can confer organ-wide protection against subsequent ischemia-reperfusion injury and mimics ischemic preconditioning. Ischemic preconditioning (IPC) was first observed by Murry et al.1 in 1986. Since the original observation that applying nonlethal doses of ischemia to target organs can confer protection against subsequent injury, it has been thought that a full understanding of this phenomenon would offer an entree to therapy for ischemic injury. After the demonstration by Murry et al.1 of this phenomenon, studies were conducted on different organs, such as heart, brain, liver, and kidney to name a few.1–5 These studies confirmed the work by Murry et al.1 and extended the observations to other organs. IPC was induced by subjecting rats to bilateral renal IRI for 30 minutes and recovery for 14 days, resulting in the resolution of serum creatinine back to levels in sham-operated controls. As expected, this maneuver significantly attenuated the elevation in serum creatinine in rats 24 hours after a second ischemic insult (Figure 1A). At this time, kidney histology shows little evidence of injury (Figure 1, B and C). Renal cortical mitochondria were isolated from IPC or sham IPC rats at 14 days and used for a proteomic screen. Table 1 shows the proteins that are significantly altered in IPC rat kidney versus sham IPC rat kidney. Twelve proteins were significantly altered (six increased and six decreased) by the 14-day IPC protocol (Table 1). Of these, IDH2 was chosen for further analysis because of its function in the TCA cycle and as a branch point enzyme for lipid and protein syntheses. To confirm these findings, we repeated the IPC protocol and conducted immune blots for IDH2 on mitochondria isolated from renal cortex, showing an approximate tenfold increase in IDH2 compared with control rats (Figure 1D). IPC or Idh2 protects kidney from injury. (A) Rats were subjected to sham, sham IPC IRI, and IPC IRI surgeries and subsequent IRI evaluated by serum creatinine (SCr) after 24 hours (n=5 per group; P<0.05 sham IPC versus IPC). *P<0.05. Hematoxylin and eosin–stained sections of (B) renal cortex and (C) outer medulla in sham IPC animals. Scale bar, 20 μm. (D) Immune blot of IDH2 in animals injected with saline or Idh2 or after IPC (left panel). Right panel illustrates the ratio of IDH2 to Actin using FIJI (n=6 per group). *P<0.05, IDH2 versus vehicle; #P<0.05, IPC versus vehicle. IDH2 myc localization in (I) National Institutes of Health 3T3 cells transfected with N-terminal myc-tagged Idh2 or (E) cells that were not transfected. (F) Blue channel for nuclei stained with Hoescht 33342. (G) Green channel for anti-myc labeled with FITC. (H) Red channel showing Mitotracker staining. Scale bar, 20 μm. (J) Quantitative analysis of PI staining of S3 MPTCs. All bar graphs are expressed as mean±SD. *P<0.05, hypoxic Idh2 versus hypoxic control. Initial screening of Idh2 activity used immortalized murine renal proximal tubule S3 cells (MPTCs), which were derived from a large T antigen mouse through direct microscopic dissection and have been used in studies of acute ischemic injury and nephrotoxic kidney injury.20,21 To confirm that exogenous Idh2 targets mitochondria, in vitro transfection was performed using an N-terminal myc-tagged Idh2. Multiphoton imaging revealed that myc-tagged Idh2 clearly localized in mitochondria stained with Mitotracker red (Figure 1, E–I). The Manders coefficient for colocalization was 0.8, indicating a high degree of mitochondria colocalization.22 S3 cells transfected with plasmids bearing Idh2 were resistant to necrosis after hypoxia compared with mock transfected cells (9%±7.8% versus 42%±27.6%; P<0.05) (Figure 1J). Cells transfected with Idh2 maintained higher intracellular ATP/AMP ratios even in response to hypoxia (Figure 2A) and have elevated mitochondria membrane potential (Figure 2B). These increases in membrane potential are also linked with improved cell health and survival (P<0.05) (Figures 1H and 2B). Idh2 transfection alters mitochondria activity and function. (A) ATP-to-AMP ratios in MPTCs with or without Idh2 and hypoxia. (B) JC-1 fluorescent intensity ratios in MPTCs with or without Idh2 after hypoxia. All bar graphs are expressed as mean±SD. *P<0.05, hypoxic Idh2 versus hypoxic control; #P<0.05, IDH2 versus control. Figure 3A depicts the effects of Idh2 transfection on mitochondria respiration in S3 cells. Baseline oxygen consumption rate (OCR) of MPTCs was 29.4±6.8 pmol/min per cell, whereas transfection with Idh2 or myc-tagged Idh2 significantly increased the OCR to 41±2 and 39.6±4.7 pmol/min per cell, respectively (Figure 3B). Transfection with either Idh2 or myc-tagged Idh2 resulted in a statistically significant increase in OCR compared with control or mock transfected cells (Figure 3B). Maximal uncoupled respiratory capacity after addition of carbonyl cyanide p-trifluoromethoxyphenylhydrazone was also enhanced by Idh2 or myc-Idh2 transfection (Figure 3C). Complex 2 OCR, evaluated after the addition of Rotenone and Antimycin A, was also significantly increased by either myc-Idh2 or Idh2 transfection (Figure 3D). Finally, in vitro analysis was to test if Idh2 over expression affected reserve or spare respiratory capacity (SRC). This is measured as the difference between maximal respiration and baseline respiration. Control S3 cell SRC was 23.5±8.4 pmol/min per cell. In cells transfected with Idh2, SRC was 31.9±11 pmol/min per cell, indicating that the addition of Idh2 increased MPTC SRC. However, the SRC in myc-Idh2 transfected cells was 26.9±7.8 pmol/min per cell, a value that was not significantly different from mock or control samples. This likely reflects a partial inhibitory effect of the myc tag on IDH2 integration in the oxidative phosphorylation pathway. IDH2 increases cellular respiration in MPTCs. (A) Respiration was analyzed using a Seahorse. Seven micromolar carbonyl cyanide p-trifluoromethoxyphenylhydrazone (FCCP) and 6 μM Rotenone and Antimycin A (Rot/AA) were added to determine (B) baseline, (C) maximal, and (D) complex 2 OCR. (E) Maximal respiration minus baseline respiration was used to calculate SRC (n=9 wells per group). All bar graphs are expressed as mean±SD. *P<0.05, IDH2 versus control; **P<0.05, IDH2 versus mock; #P<0.05, myc Idh2 versus control; $P<0.05, myc Idh2 to mock. Retrograde hydrodynamic injection of plasmid cDNA through the renal vein has been shown to be an effective means of facilitating exogenous gene expression in the rat kidney.19 To evaluate the effects of Idh2 upregulation in the kidney, N-terminal myc-tagged Idh2 or saline was delivered by hydrodynamic injection. After 7 days of recovery, isolated renal cortical mitochondria contained approximately threefold higher levels of IDH2 versus animals injected with saline alone as indicated by immune blots (Figure 4A). These data indicate that hydrodynamic delivery of Idh2 results in sustained expression of protein in proximal tubule mitochondria to levels comparable with those observed during resistance to IRI after IPC. IDH2 localizes to the mitochondria and alters function in vivo. (A) Representative immune blot of protein (5 μg) from mitochondria extracts. Lanes 1–3 are saline only, and lanes 4–6 are myc-tagged IDH2 (left panel). Band densitometry (right panel) of ratio of myc-tagged IDH2/Actin is shown (n=4 per group). *P<0.05, myc IDH2 versus vehicle. (B–F) TMRM-labeled mitochondria by intravital microscopy in (B) sham rats, (C) rats after injection of saline, (D) Idh2, or (E) IPC. (F) Intensities from each group were then averaged, giving a mean TMRM intensity value (n=50 tubules per rat). DT, distal tubule; PT, proximal tubule. Scale bar, 20 μm. *P<0.05, IDH2 versus vehicle; #P<0.05, IPC versus vehicle. (G) Respiration of isolated renal mitochondria 1 week after saline or Idh2 injections. Oxygen flux was assayed after addition of isocitrate, malate, pyruvate, succinate, and ADP (n=3 per group). All bar graphs are expressed as mean±SD. IMD, isocitrate, malate, and ADP; IMPD, isocitrate, malate, pyruvate, and ADP; IMPSD, isocitrate, malate, pyruvate, succinate, and ADP. *P<0.05, Idh2 versus vehicle; #P<0.05, Idh2 versus vehicle; $P<0.05, Idh2 versus vehicle. Because IDH2 was found to localize to mitochondria, we analyzed changes in mitochondria function in response to IRI. Mitochondria polarization was evaluated with TMRM and intravital imaging. After 2 weeks of IPC (i.e., 14 days after recovery from 35 minutes of IRI), the TMRM signal from rat kidney tubules was significantly elevated relative to that observed in sham IPC control rats (Figure 4, B and E). Similarly, rats subjected to Idh2 delivery have significantly increased TMRM signal relative to saline-injected control animals (Figure 4, C, D, and F). To evaluate whether Idh2 delivery in vivo influenced mitochondria respiration, renal cortical mitochondria were isolated and analyzed using oximetry. Respiration was measured in response to isocitrate, pyruvate, and succinate to evaluate complexes 1 and 2 activity. Mitochondria isolated from Idh2-treated animals showed increased state 2 and state 3 respiration relative to saline-injected animals, regardless of the substrate used (Figure 4G). To determine if Idh2 delivery mimics IPC, we subjected rats to either IPC or Idh2 delivery and allowed them to recover. As expected, IPC-treated rats were resistant to IRI as indicated by reduced serum creatinine 24 hours after IRI relative to sham IPC. 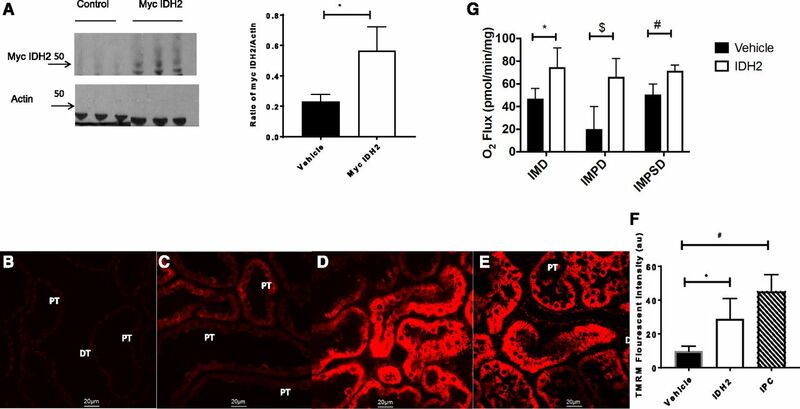 Interestingly, Idh2 resulted in a similar reduction in serum creatinine (Figure 5A) and improved tissue histology in response to IRI (Figure 5, B–E). Analysis of mitochondria 60 minutes after reperfusion showed that IDH2 preserved respiratory capacity relative to vehicle controls (Figure 5, F and G). Finally, IPC and Idh2 delivery both increase ATP levels versus sham and saline-injected control animals, indicating that IDH2 enhances ATP stores, thereby protecting against IRI (Figure 5H). Idh2 mimics IPC. (A) Comparison of serum creatinine (sCr) after IPC or Idh2 delivery 24 hours after IRI (n=5 per group). *P<0.05, Idh2 versus vehicle; #P<0.05, IPC versus vehicle. (B–D) Hematoxylin and eosin–stained section of renal outer medulla after IRI in rats treated with (B) saline, (C) Idh2 injection, or (D) IPC is shown, and corresponding injury scoring is in E. Scale bar, 20 μm. *P<0.05, IRI IDH2 versus IRI saline; #P<0.05, IRI IPC versus IRI saline. Mitochondria respiration 1 hour after IRI in vehicle- or Idh2-treated rats is shown with (F) pyruvate or (G) succinate as a substrate (n=7 per group). *P<0.05, Idh2 IRI versus vehicle IRI. (H) Renal ATP-to-AMP ratios are shown in sham-, vehicle-, Idh2-, and IPC-treated rats (n=3 per group). All bar graphs are expressed as mean±SD. *P<0.05, Idh2 versus vehicle; #P<0.05, IPC versus sham. AKI remains a significant cause of comorbidity in the hospital setting, with supportive care as the sole treatment available. Therefore, measures that prevent AKI are likely to garner rapid clinical acceptance particularly, because AKI is associated with increased mortality and risk of progression to ESRD.10,23–26 Among the potential clinical interventions available to prevent AKI, IPC has been shown to activate cellular adaptations that confer resistance to subsequent ischemic stress.8,27,28 However, clinical trials of IPC have failed to show consistent protection against AKI, and the variance between tested protocols make it impossible to identify the root cause for success or failure. Mitochondria are important regulators of normal physiology. Recently, loss of genes, such as APOL-1, has pointed to the importance of mitochondria in regulating disease, specifically kidney diseases.29,30 AKI targets renal mitochondria and initiates bioenergetic changes that alter the relative contribution of oxidative phosphorylation and glycolysis to cellular ATP stores.11,31 Substantial bodies of evidence point to adaptive changes in mitochondria protein composition mediated by PGC-1α and TFAM after IPC.32–35 Changes in cellular localization of GSK3-β and hexokinase fundamentally alter the propensity of the mitochondria transition pore to open, thereby inducing a cell death cascade.36,37 Additional changes in Ψm and state 1/3 mitochondria respiration have also been reported in response to IPC.38–40 Taken together, interventions designed to alter mitochondria physiology in a manner similar to IPC are also likely to confer cellular resistance to ischemic injury in a reliable way. In this communication, we use a proteomic analysis of mitochondria isolated from the renal cortex of ischemic preconditioned Sprague–Dawley rats using a timed renal pedicle crossclamp to induce the preconditioned state. Mitochondria were isolated 2 weeks after IPC using an isolation method that maintains mitochondria functionality rather than biochemical purity. Many of the proteins in the proteome of preconditioned mitochondria were readily identified as belonging to oxidation phosphorylation, fatty acid metabolism, and Reiske protein pathways (Table 1). The cell signaling systems responsible for these changes in mitochondria composition are still unclear. Preliminary work by our laboratory failed to identify any changes in endogenous metabolites observed by Hato et al.41 in response to endotoxin, and we were not able to observe an increase in ROS that may account for altered mitochondria protein gene transcription.42 Our findings suggest that more work is needed to identify the adaptive signaling in response to IPC. To test whether a protein identified in the proteomic screen was of potential use for conferring resistance to ischemia, we used a cell culture hypoxia injury system to assess a candidate’s efficacy in conferring protection against hypoxia. The MPTC line used in this study has been grown under conditions, whereby virtually all of their intracellular ATP is produced by oxidative phosphorylation.43 Because the cells require 38% oxygen concentration to maintain growth, these cells are susceptible to hypoxic injury.44 These qualities make the cell line uniquely appropriate for use in hypoxia injury studies to screen candidate genes to determine if they confer resistance to hypoxic injury. In our assays for cell injury, using an assay that predominantly measures cell necrosis, S3 cells transfected with either N-terminal myc-tagged Idh2 or Idh2 were resistant to hypoxic injury. In vitro transfection models indicate that IDH2 localized to the mitochondria (Figure 1, C–G). IDH2 serves both reductive and oxidative functions ranging from glutathione reduction to NAD(P)H generation depending on cellular requirements.12,45–49 To study these changes, we analyzed membrane potential and respiration in both in vivo and in vitro models. Our data indicate that mitochondria membrane potential was increased in Idh2 transfected cells compared with controls. Changes in mitochondria membrane potential are linked with changes in reduction potential (i.e., electron movement), leading to increases in oxidative phosphorylation. Our data indicate that IPC or retrograde injection of Idh2 protects mitochondria from IRI and leads to increased reduction potential compared with our control animals (Figure 4, B–F), and these increases are linked to cell survival and avoidance of cell death pathways.50 It is our hypothesis as well as that of many others that, after injury, mitochondria revert to a Warburg state manifest by a shift to glycolysis.51–53 This allows accumulation of glycolytic metabolites, lipids, and nucleic acids that will aid in cellular repair.51–53 However, increases in mitochondria membrane potential in response to preconditioning or Idh2 retrograde injection indicate that this glycolytic shift may not occur. Idh2 acts to increase metabolic output in preparation for injury. Strikingly, our analysis of mitochondria respiration found increased states 1 and 2 respiratory capacity in Idh2 transfected cells. Our results indicate that gene transfection leads to increases in baseline, maximal, and complex 2 respiration (Figure 3), indicative of increased oxidative phosphorylation. 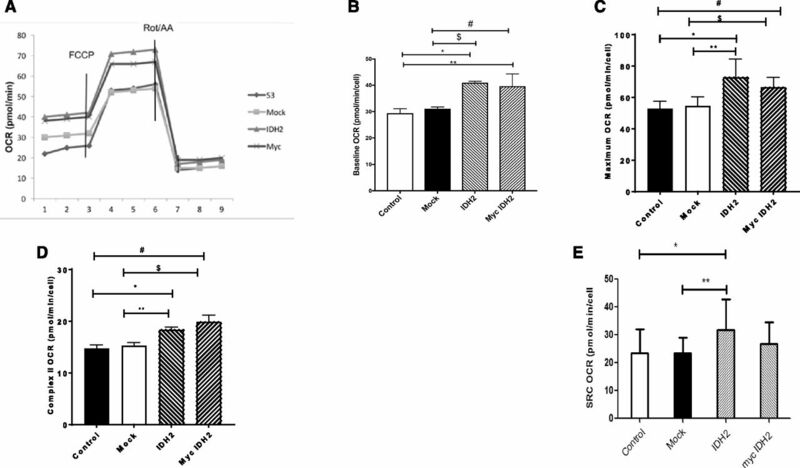 Interestingly, Idh2 transfection also increased SRC, which has been linked to cell survival of cells prone to oxidative stress.54–57 Idh2 transfection increases SRC, indicating that, before injury onset, cells are primed to handle oxidative stress and allocate the additional energy to aid in cellular recovery. The increase in SRC is linked with decreases in serum creatinine, and reductions in hypoxia induced cell death. Data from cell culture studies suggest a fundamental shift in mitochondria physiology, in which additional Idh2 expression resulting from exogenous gene delivery increases metabolic flux through the mitochondria aided by an increase in membrane potential. To further confirm these findings, we next examined whether exogenous gene delivery in vivo would recapitulate cytoprotection in vitro. All fluorescent probes were purchased from Thermo Fisher Scientific (Waltham, MA). IDH2 antibody was purchased from Protein Tech (Chicago, IL). The c-MYC antibody, (9e10) developed by J.M. Bishop at the University of California, San Francisco was obtained from the Developmental Studies Hybridoma Bank created by the National Institute of Child Health and Human Development of the National Institutes of Health and maintained at The University of Iowa, Department of Biology in Iowa City, Iowa. β-Actin was purchased from Millipore (Billerica, MA). All secondary antibodies were purchased from Jackson Laboratories (West Grove, PA). All plasmid DNA was purchased from Origene (Rockville, MD). FIJI was downloaded from the National Institutes of Health website (National Institutes of Health, Bethesda, MD).60 Lipofectamine 3000 was purchased from Thermo Fisher Scientific. Seahorse reagents and kits were purchased from Agilent (Santa Clara, CA). Male Sprague–Dawley rats (250–350 g; Envigo, Indianapolis, IN) were used for our in vivo studies. Rats had access to food and water, and all experiments conducted followed National Institutes of Health guidelines. Rats were randomly assigned to control or experimental groups. Approval from the Indiana University School of Medicine Institutional Animal Care and Use Committee and the Richard L. Roudebush Veterans Affairs Medical Center Animal Care and Use Committee was gained before all in vivo studies. S3 proximal tubule cells were grown as previously described.61 Validation of the cell line origin was performed by IDEXX BioResearch (Columbia, MO), and the cells have the following STR profile: MCA-4–2: 20.3; MCA-5–5: 17, 18; MCA-6–4: 14; MCA-6–7: 12, MCA-9–2: 15; MCA-12–1: 16, 17; MCA-15–3: 22.3; MCA-18–3: 17; MCA-X-1: 28. National Institutes of Health 3T3 cells62 were purchased from American Type Culture Collection (Manassas, VA) and maintained in culture according to American Type Culture Collection recommendations. MPTCs were transfected using Lipofectamine 3000 according to the manufacturer’s specifications (Thermo Fisher Scientific). Two days after transfection, cells were plated into a 96-well plate. Twenty-four hours later, the JC-1 assay was performed as follows. JC-1 (5 μM) was added to each well. Media and cells were placed in a hypoxia chamber for 30 minutes. After hypoxia, fluorescence was measured using a Molecular Devices SpectraMax M5 microplate reader (Molecular Devices, Sunnyvale, CA) with an excitation wavelength of 488 nm. Emission was measured at both 527 and 590 nm. MPTCs were cultured in modified essential media (50:50 HAM F-12:DMEM with l-glutamine, HEPES, sodium selenite, sodium pyruvate, phenol red, and insulin) supplemented with 1% penicillin-streptomycin, 7% FBS, and 4.1% sodium bicarbonate solution (Sigma-Aldrich Corporation, St. Louis, MO) and grown at 37°C, 5% CO, and 38% O2. National Institutes of Health 3T3 cells62 were cultured in DMEM essential media (American Type Culture Collection) supplemented with 10% FBS and 1% penicillin-streptomycin and grown at 37°C in a 5% CO2 incubator. Kidney cortex was homogenized in mitochondria isolation buffer (250 mM sucrose, 20 mM HEPES, 10 mM KCl, 1.5 mM MgCl2, and 1.0 mM EDTA, pH 7.9) using a PBI S3 shredder (Pressure Biosciences, Easton, MA). The homogenate was centrifuged at 800×g for 10 minutes at 4°C. The supernatant was collected and centrifuged at 14,000×g for 10 minutes. Mitochondria pellet was suspended in mitochondria isolation buffer and then centrifuged at 14,000×g for 10 minutes. The pellet was suspended in mitochondria isolation buffer and used immediately for respiration analysis. Mitochondria protein content was determined using a Bradford assay (Bio-Tek Instruments Inc., Winooski, VT). Mitochondria respiration was measured using an Oroboros Oxygraph-O2k (Oroboros Instruments, Innsbruck, Austria) as previously described.69,70 Equivalent amounts of mitochondria protein were loaded into a final volume of 2.0 ml miRO5 (110 nm sucrose, 20 mM HEPES, 20 mM taurine, 60 mM K-lactobionate, 3 mM MgCl2, 10 mM KH2PO4, 0.5 mM EGTA, and 1 g L−1 BSA, pH 7.1) respiration buffer. After addition of isolated mitochondria, oxygen flux was allowed to stabilize before addition of substrates or ADP. Substrates were added in the following order and diluted to the following concentrations: 10 μM Isocitrate, 2.5 μM Malate, and 20 nM ADP; 7.5 μM Pyruvate and 20 nM ADP; and 10 μM Succinate, and 20 nM ADP. Data were analyzed using Oroboros Datlab version 6 (Oroboros Instruments), and calibration before experimentation was conducted according to Oroboros protocols. Mitochondria respiration was conducted using a Seahorse XF 96 extracellular flux analyzer as previously described71; 5000 MPTCs were plated in a Seahorse XF 96 cell culture microplate 24 hours before analysis. Analysis was performed with the appropriate growth media containing 10 mM glucose, 100 mM sodium pyruvate, and 1 M glutamine. Cells were allowed to acclimate for 1 hour before analysis. Baseline measurements were conducted for transfected and mock transfected cells before compound addition. Respiration measurements were conducted after injections of 7 μM carbonyl cyanide p-trifluoromethoxyphenylhydrazone and 6 μM Rotenone/Antimycin A. All flux data are expressed in OCR in picomoles per minute per cell. In total, 2.0×105 cells were plated onto a six-well plate the day before transfection. Twenty-four hours later, cells were transfected with either Idh2 cDNA or myc-tagged Idh2 cDNA using Lipofectamine 3000 according to the manufacturer’s specifications. All subsequent studies (immunohistochemistry, cell necrosis, or mitochondria respiration analysis) were performed 48 hours post-transfection. All transfections were performed 48 hours before exposure to hypoxia. One group of cells was transfected with a green fluorescent protein–expressing plasmid to ensure transfection efficacy. Transfected, mock transfected, and control S3 cells were subjected to 90 minutes of warm hypoxia by incubating the cells in a 1% O2 and 5% CO2 hypoxia chamber (Biospherix Ltd., Parish, NY) maintained at 37°C. Cells were removed from the hypoxia chamber incubated with propidium iodide (PI) as previously described.72 After washing media supplemented with PI, the samples were fixed with paraformaldehyde and stained with Hoechst 33342. The percentage of necrotic cells was determined by scoring the number of cells with PI and Hoechst 33342 staining divided by the number of Hoechst 33342–positive cells. All statistical analyses were conducted using either a two-tailed unpaired t test or one-way ANOVA with Tukey multiple comparison test. Colocalization was determined using the Manders localization analysis.22 All bar graphs are expressed as mean±SD. All experiments were conducted in duplicate with at least one control group and one experimental group to ensure random assortments. We were blinded for only injury scoring. B.A.M. is a founder of Fast Diagnostics and a paid consultant to Mitobridge. R.L.B. is a founder of Rene Medical. The authors thank the staff of the Indiana Center for Biological Microscopy for their expert advice and support. The authors also thank Dr. Robert Harris for many helpful discussions. J.A.C. is supported by National Institutes of Health grant T32 HL07995. B.A.M. is supported by the O’Brien Center for Advanced Renal Microscopic Analysis at the Indiana Center for Biological Microscopy. B.A.M. received grant support from National Institutes of Health grants DK091623 and DK079312 and the Veterans Administration through a Merit Review award. D.P.B. is supported by National Institutes of Health grant DK063114. R.L.B. is supported by Veterans Administration Merit award BX001736. S.A.J. was awarded grants from the National Institutes of Health (DK088934 and DK053194).